Biologic imaging reagents play a fundamental role in today’s medical, pharmaceutical and biotechnology industries. Such reagents are integral to the diagnostics industry, which is the largest market for these products. Driven primarily by advancements in biomarker technology in medical diagnostics, the global market for biologic imaging reagents has the potential to reach $23.9 billion by 2022. In a new study by BCC Research, the industry’s prospects are examined by the main reagent classes: contrast, nuclear (radioactive) and optical. Optical imaging reagents allow life sciences researchers and drug developers to visualize and detect biological processes at the molecular level and to perform key genomics, proteomics and cellular analysis assays. Nuclear and contrast reagents provide important diagnostic information to physicians, enabling the early detection and treatment of diseases in the areas of cardiology, neurology and oncology. From less than $15 billion in 2017 sales, the global biologic imaging market is expected to achieve double-digit growth through 2022. Efforts are underway to improve the value of quantitative imaging biomarkers by establishing interoperability among clinical systems. 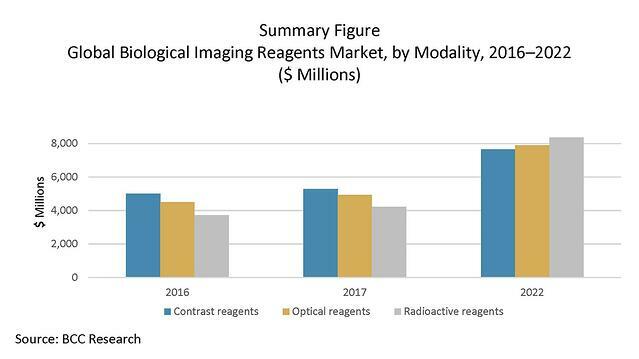 Although contrast reagents accounted for the largest share of revenue in 2017, radioactive agents are expected to have the highest growth during the forecast period, topping $8 billion by 2022. Growth in the fields of genomics, proteomics, cellular analysis and in vitro diagnostics will continue to drive demand for in vitro optical imaging reagents. Contrast reagents include those used in magnetic resonance imaging, ultrasound and x-ray/computed tomography. Nuclear reagents encompass imaging radiopharmaceuticals. Optical reagents consist of fluorescent dyes and probes, gold nanoparticles, quantum dots and fluorescent proteins. Nanoparticles are small particles, with one or more dimensions of 100 nanometers or less, that are used in biotechnology applications such as drug delivery systems or imaging agents. Nanoparticles are larger than fluorescent dyes, which have an average size of less than 0.5 nanometer. Nanoparticles are used in small animal in vivo imaging and in vitro diagnostics. A nanoprobe is a type of optical device that produces an image based on the Raman scattering effect of light. The reflected light demonstrates vibration energies that are unique to each object, allowing them to be characterized and identified. Nanoprobes that have been developed at the University of Birmingham can be used to track blood flow within the smallest blood vessels in the body (the microvasculature). This information can help with the earlier diagnosis of conditions such as thrombosis and vascular inflammation. Because of their small size, nanoprobes do not disturb the blood flow. Trials have shown how the nanoprobes enter blood circulation and are able to be imaged by fluorescence in different organs. In addition to imaging, a future application could involve their use in targeted drug delivery. The research has been published in the journal Nanomedicine. Continuous developments in quantitative imaging biomarkers have created the need for standards. The images acquired are not uniform, and there can be differences in interpretation at different levels. Image-based assessment of treatment responses can be highly variable, depending on the make and model of the imaging equipment used; how the images were acquired and processed; and the guidelines used for interpretation. For more research and market forecasts, download the report overview for Biologic and Medical Imaging Reagents: Global Markets (HLC040E).